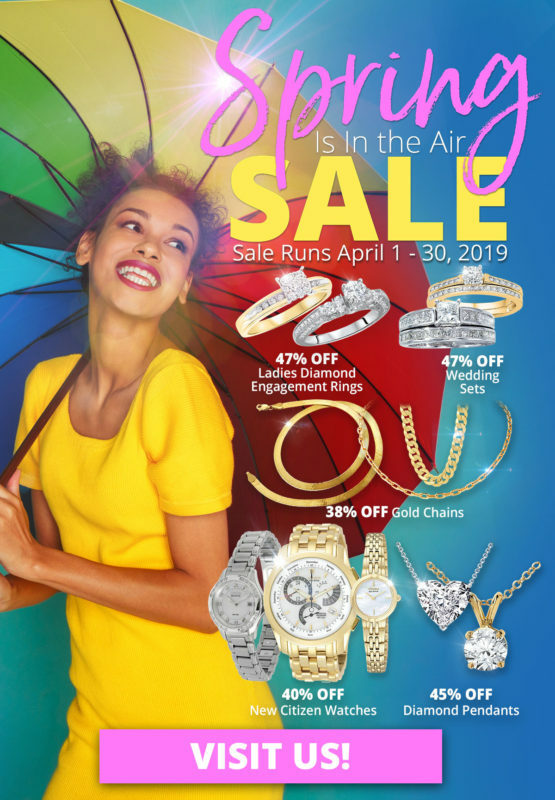 Spring Sale, April 1 – 30, 2019. 47% OFF Ladies Diamond Engagement Rings, 47% OFF Wedding Sets, 38% OFF Gold Chains , 40% OFF New Citizen Watches, 45% OFF Diamond Pendants. Layaway discounts must be reduced by 12.5%. Offer cannot be combined with any other offer. Discount not available on previously sold merchandise. Excludes all 3rd party appraised/certified jewelry. Rolex, gold and other high end watches excluded. This entry was posted in Current sales at Best collateral, Promotions at all BC Pawn Shops. Bookmark the permalink.